It has been awhile since I did a Dinner during Dora post. The basic idea is to post a recipe that you can make during the time it takes for your kids to watch a Dora episode. If you want to play along, just post your own recipe, and then add a comment to my first Dinner during Dora post. Some day, I may figure out how to get the trackback links working, too. This dinner only comes together during Dora if you shred the carrots ahead of time- so unless I have some shredded carrots, this is a weekend dinner. On weekends, I can start dinner a little earlier and Hubby is around during the cooking to help entertain the kids. Of course, Hubby could also do the cooking, and often does.... so this meal doesn't get made all that often. 1. Grate the carrots, if you don't have some pregrated. I try to pregrate and freeze. 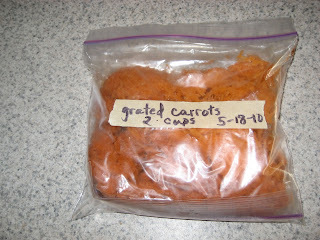 I double bag the grated carrots in sandwich bags, and have never had any trouble defrosting them and using them. 2. 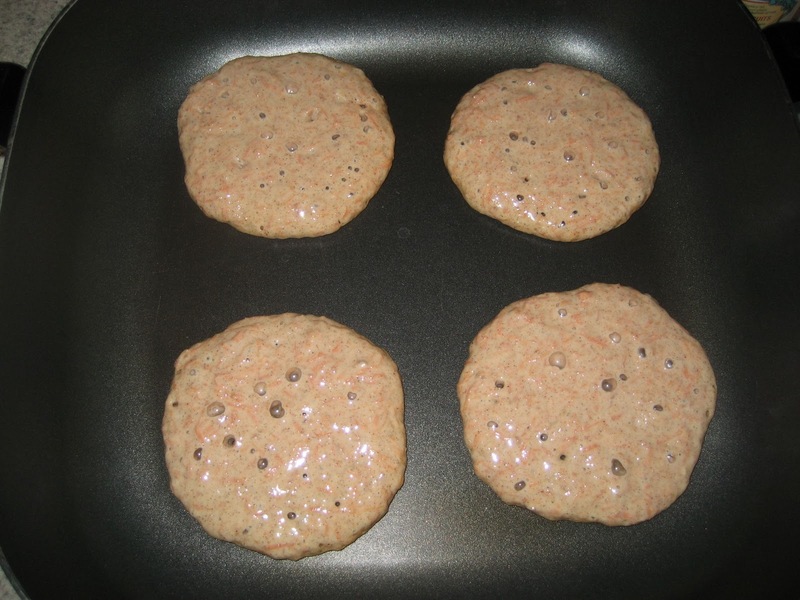 Start whatever you're going to use to cook the pancakes heating. I always forget to do this! I use an electric skillet, set to about 375 deg F.
3. 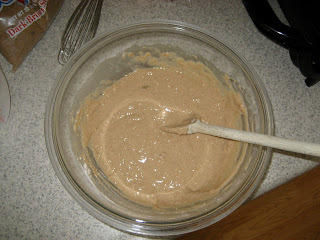 Combine the flour through the allspice in a large bowl, stirring with a whisk. You'll add the liquid to this bowl, so start with a big bowl. 4. Combine the brown sugar, buttermilk (or soured milk), and eggs in a bowl. 8. Flip and cook another minute or so. I usually flip them again and dither about whether they are done. I suspect that step can be skipped! The recipe makes about 12 pancakes. I serve this with a little bit of bacon and smoothies. We gave some to Petunia the last time we made it (she was just about 10 months old), and she smooshed it around a bit and then threw it on the floor. Seeing that freezer label with the carrots all organized with the date and everything just made me have a momgasm. (What is wrong with me?) Seriously. You rock!! Carrots in the pancakes? I LOVE IT! I'm definitely going to try this one, since I am an expert pancake maker. For the next week (maybe two), hubby is the manager of a proposal, so I'll be the morning and evening (and bedtime) caregiver. What a great opportunity for me to try some Dinner during Dora recipes! Ooh that looks delicious! I'll have to try it, either as a breakfast or dinner meal. One of my favorite solutions for "got home late, no desire to shop or cook" is scrambled eggs, with or without any number of add-ins (meat, cheese, vegetables). My husband also recently took some leftover burrito filling that wasn't quite enough for dinner, scrambled some eggs with it, and we had breakfast burritos for dinner. just found your blog via moxie comments - i'm in san diego too! i love the "dinner during dora" idea, we do that too at our house and those pancakes look good. 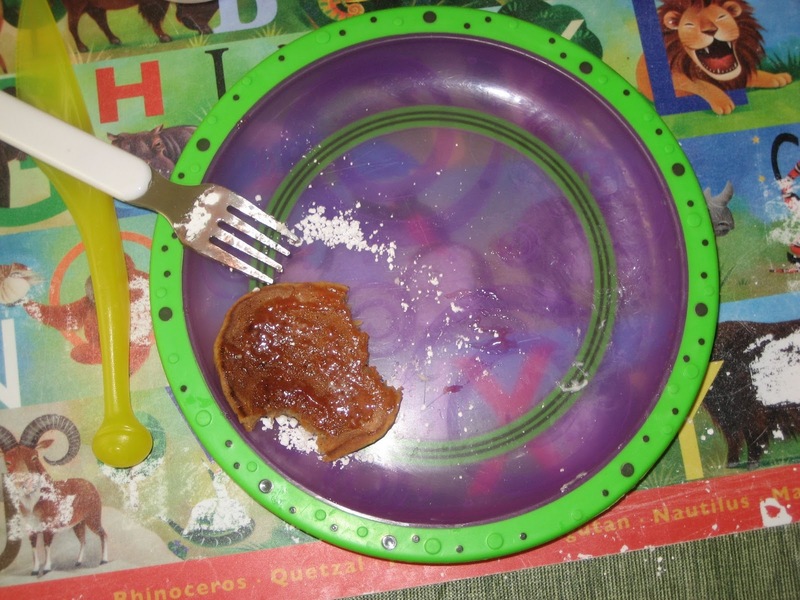 f has become a picky eater lately, especially at breakfast time. i might have to try those at night and then re-heat them in the a.m. I wonder if this recipe will work with pureed carrots? I was inspired by Jessica Seinfeld's method of: cooking, pureeing and freezing veggies to then defrost and sneak into foods. I think she sneaks beets into her pancakes. Thanks, everyone! I'm glad you like the recipe. @hush- this is what happens when a project manager and an engineer get married and run a house together. I can only imagine how over-organized our house would be if I didn't work and had to funnel all my organizational energies into the home! @caramama- you'd better post your recipes! @Irene- breakfast burritos are a go to dinner here, too. In fact, we had them tonight! @hilahil- welcome! Julie and I keep threatening to organize a SoCal Moxie meetup, and never get around to it. We really should. @geeks in rome- I know of someone who uses carrot puree in pancakes, but I can't drag the source out of my memory right now... if I think of it, I'll let you know! 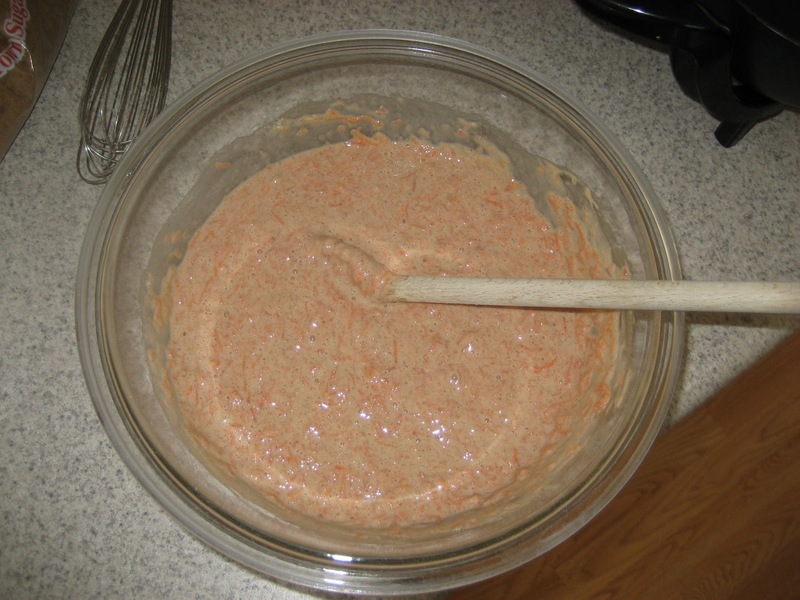 Since I have carrot babyfood laying around I could just throw that in instead of the grated. Just like the puree suggestion. Great ideas! 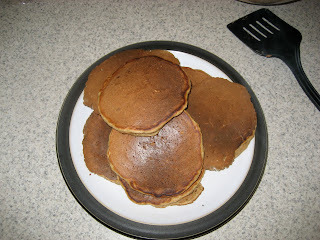 And now I'm craving panckaes!